Robert J. Berkowitz, Esq. has been practicing law in New York City and the outlying counties exclusively in the field of personal injury and medical malpractice for twenty-five years. Mr. Berkowitz has recovered millions of dollars on behalf of his clients in a broad range of serious injury and wrongful death cases arising from automobile accidents, slip, trip and fall accidents, negligent premises security cases, construction accidents, assault and battery cases, medical malpractice and dangerous and defective products including contaminated food products. 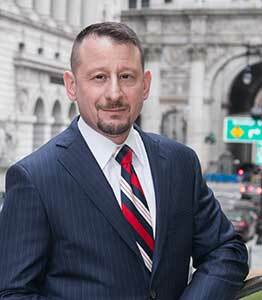 Moreover, Mr. Berkowitz has also successfully prosecuted Civil Rights actions in the areas of police misconduct, hostile work environment and sexual harassment. He is known for his aggressive, dynamic style and his “no-nonsense” approach to prosecuting personal injury actions. 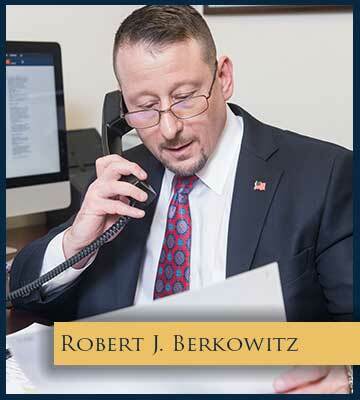 Mr. Berkowitz holds his obligations to his clients dear to his heart and provides clients with a realistic brass-tacks assessment of their cases and unlike many other attorneys, refuses to make promises he can’t keep. Mr. Berkowitz has been widely recognized especially in the field of premises security cases and is often referred cases from other prominent law firms to prosecute these types of cases on their clients’ behalf. Mr. Berkowitz graduated from Tulane University with a Bachelor of Science in Psychology. After graduation, Robert received a commission in the United States Marine Corps where he served as an Infantry Platoon Commander and a Company Executive Officer. Thereafter, Mr. Berkowitz attended and graduated from Brooklyn Law School in 1992, earning numerous academic awards including being named to the Dean’s List and the American Jurisprudence Award for Trial Advocacy. It runs in the family! Mr. Berkowitz is a “second generation” personal injury attorney. Robert’s father, Seymour Berkowitz, Esq. was a well-known trial attorney, who also was known for his aggressive, active style of practice and who practiced for more than 50 years. Robert was the lucky recipient of his father’s knowledge and wisdom regarding the practice of personal injury law. After law school Robert was an associate at a prominent Insurance Defense Firm where he successfully defended personal injury cases from inception through Trial. In 1999 Mr. Berkowitz then founded his current practice.